Shinhwa has made a successful return to the K-pop music scene. The six-member boy band, which enjoyed immense success in the early 2000's, dropped its comeback single "Sniper" and held its first onstage performance in almost a year. Shinhwa, which debuted in 1998, stormed the stage with "Sniper" and "Alright," performed on K-pop television program Mnet's "M Countdown" on Thursday evening. Though it lost out on the evening's top award to girl group 4Minute's "Crazy," the group nevertheless drew plaudits from local media. Shinhwa's lead single "Sniper," jointly written by Andrew Jackson and London Noise, the creators of past hits "This Love" and "Venus," is underscored by a languid throbbing beat decorated with falsetto phrases and a catchy chorus. The choreography, accomplished in leopard prints, was sleek enough to capture the track's theme of obsessive love without overtaxing the 30-something veteran idol singers. The romantic crowd-pleaser "Alright" was performed in monochromatic outfits and with chairs, which drew references to Shinhwa's 2001 hit song "Wild Eyes" from media outlets. 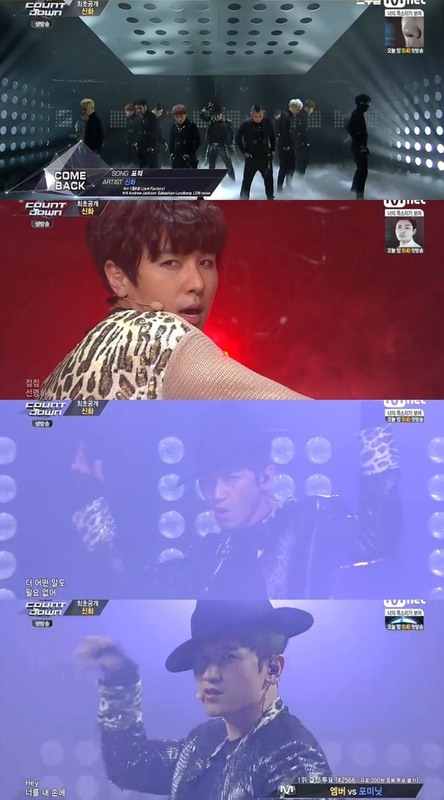 Shinhwa's comeback has not been without controversy, however. Earlier this week, Korean broadcasters KBS and SBS announced that "Cat," from their new album "We," could not be broadcast, due to a reference to trademarked company Coca-Cola in the lyrics. Shinhwa's management company, ShinCom Entertainment, said they had no plans to adjust the song's lyrics and that it would not be promoted as a single.